Join one of WA’s premier community bands for a smashing, thumping and crashing good time! Our latest concert showcases our talented percussionists, and will transport you with movie music both old and new. A great night-out for music-lovers, and the whole family alike. 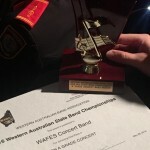 After nearly six months of hard work, the WA Fire and Emergency Services Concert Band were very pleased to place second in the A-grade division of the Western Australian Band Association State Championships at UWA. The end result was quite a credible one coming a strong second against four other top WA A Grade bands. Thank you to all band members for their efforts and congratulations to West Australian Wind Symphony for taking out first prize. We are now looking forward to preparing for public concerts in Perth and Albany later in the year- stay tuned for more information coming soon! For more highlights, follow us on facebook Western Australia Fire and Emergency Services Concert Band. The first of our concerts this year is on Sunday the 21st of August, as the WA Fire and Emergency Services Concert Band present a “Big Band Spectacular”. Come along and join us for a night of Big Band classics featuring music from favourites such as Frank Sinatra, Duke Ellington, Michael Buble and more! Performance starts at 6:30pm at the Morley Recreation Centre, corner of Wellington Rd & Mangini Street, Morley. Tickets are $20 for adults and $10 for concession holders and children under 16, and are available at the door (cash only). Tea and coffee provided. Bring supper/snacks to share with your friends. Free parking is available at the venue. For further information email us at enquiries@wafesband.org.au or contact Robert on 0438 764 107. For updates on this concert follow us on facebook Western Australia Fire and Emergency Services Concert Band. 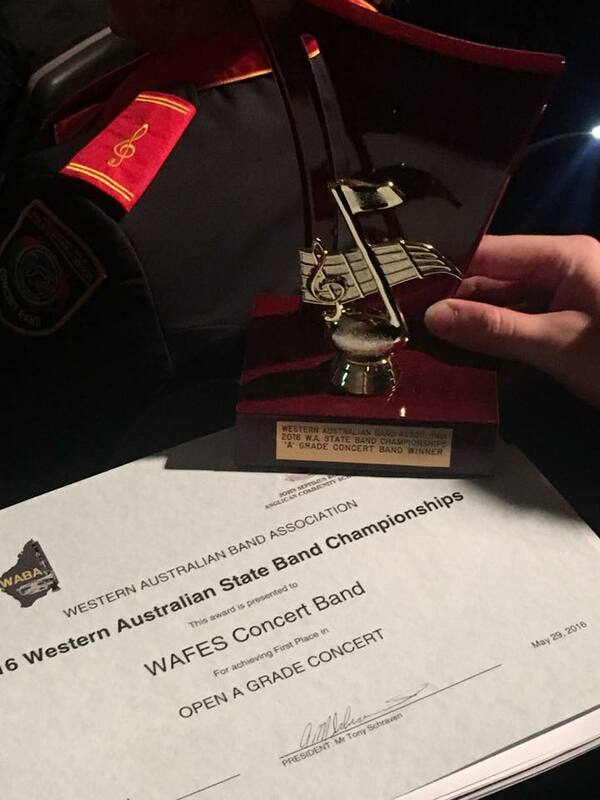 The Western Australia Fire & Emergency Services Concert Band are Western Australia’s champion A-Grade concert band for 2016, as a result of the state band championships held over the weekend of 28/29th May. The outstanding result once again followed months of detailed work on the challenging A-Grade test piece Danceries by Kenneth Hesketh, an arrangement of Abide With Me for the slow piece and Liberty Bell for the march piece. The first few months of 2016 have gone by in what feels like a run of demi-semi-quavers as the Band has participated in a number of events, including the Volunteer Fire and Rescue Service State Championships, a very-soggy ANZAC day march, and the International Firefighters day memorial services at Kings Park. We are now in the final stage of preparations for the State Band Championships on the 29th of May. Feel free to come along and support the band at John Septimus Roe Anglican Community School. 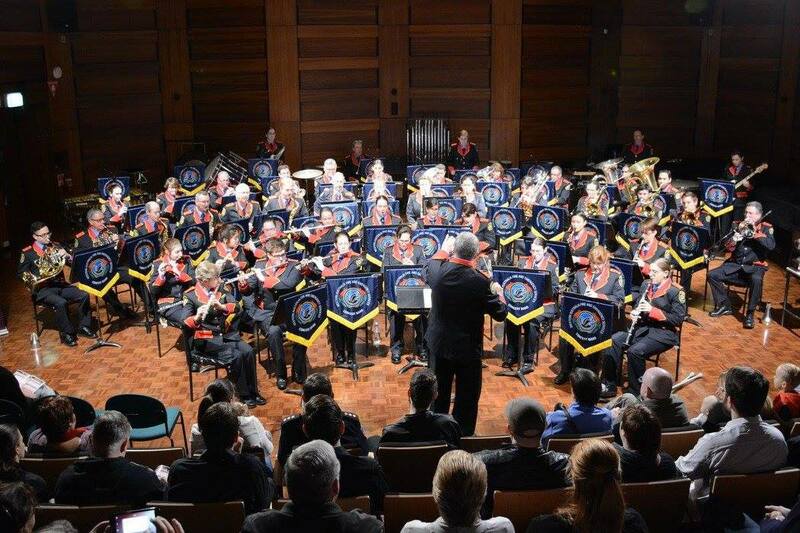 2015 was an exciting year for the band, heralding the start of our sponsorship by the Department of Fire and Emergency Services, and hence our change of identity from Perth Concert Band to the WA Fire and Emergency Services Concert Band. The new identity was accompanied by new uniforms, new relationships, new exposure and new performance opportunities. While we’re on a learning curve, it’s clear from our internal murmurings and from feedback we’ve received that the sponsorship has been greatly appreciated by all parties. 2016 is here and another change is upon us, although not nearly as earth-shaking as the sponsorship. Membership has grown dramatically in the last few years and we’ve outgrown our rehearsal venue in Mount Lawley, our home for the last seven years. We were so cramped that it was becoming difficult to squeeze in any more saxophonists, a dire and unacceptable situation. The committee have hunted around and secured a much larger venue in Morley, only about 5 minutes away from the old venue, and rehearsals have already begun there. So we can now relax, stretch out our legs, stretch out our trombones, and look forward to all the great things we’ll get up to this year.